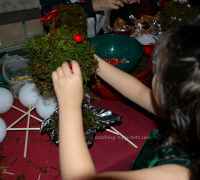 Toddler Activities: Christmas topiaries are pretty centerpieces or gifts. 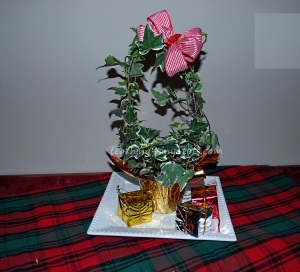 This kids activity can be made from just a few items to make a very pretty gift or Christmas decoration. Select plant and place in pot cover. 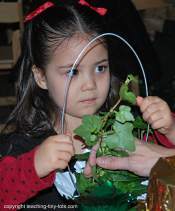 Gently hold up trailing pieces of the vine and push wire into soil in pot to secure. Wrap trailing pieces of ivy around the wire. 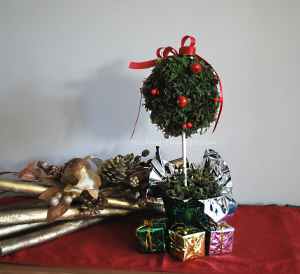 Add a bow on the wire to decorate. If you are doing it with a group of children, set it up assembly line style. 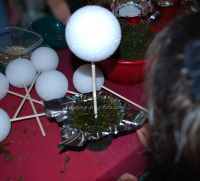 Great toddler activity that can be tailored to any holiday or occasion. Simply change the color of the foil wrapper and the bow to suit. Variegated ivy leaves will typically have green and white or yellow markings on their leaves. The white and yellow areas on the variegated ivy leaves lack chlorophyll. Chlorophyll serves many purposes, the main ones being producing food for the variegated ivy plant and protecting the plant from the rays of the sun. Because variegated ivy leaves have less chlorophyll, the plant produces less energy for growth. This means variegated ivy plants tend to grow much slower than their all green cousins. This means that variegated ivy requires slightly different care than green ivy. 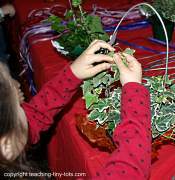 A variegated ivy plant needs less sunlight and should be placed out of direct sunlight. Proper care of a variegated ivy requires that you place the ivy plant in indirect or filtered bright sunlight. Variegated ivy leaves will burn if placed in direct sunlight. Variegated ivy will do best on a window sill behind a sheer curtain. The second tip is to significantly reduce the amount of fertilizer you give the plant. This kids activity if for children 5+ and will require adult assistance. 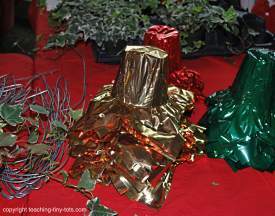 We made these at a Christmas event at a botanical garden. The end result is cute but it was much more difficult that the ivy topiary above. Place pot into foil cover and place cylinder shaped styrofoam in the pot. Gently press dowel into cylinder shaped styrofoam and into circle styrofoam. Remove the dowel and put glue into the hole made by the dowel in the styrofoam. Push the dowel back into both pieces. Let dry. Take a piece of moss, place in the pot to cover the styrofoam. Repeat until base of dowel is surrounded by moss. Take pieces of moss and place on round styrofoam. Push a brad into the styrofoam to secure. Continue until entire styrofoam is covered. Tie a ribbon around the entire piece. Use a spray bottle to spritz water to keep it fresh. Be sure that you let glue dry to hold the dowel in place or it will move around as you apply the moss making it difficult to secure. Brads should be first inserted by adult and then if child is able, push the rest of the brad into the styrofoam.